Free Fishing Reports > Northeast > New York > North Shore > After Work Bass Bite! 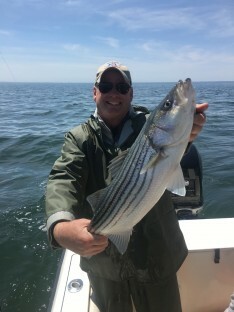 After a hectic day of work, it’s always nice to hit the water for a few hours of fishing… Rich and Skip along with Tom hit a few spots and found a nice bite of Striped Bass !!! Rich had a nice 32″ fish among other short fish, but the best part … we weren’t working…we were fishing !! !